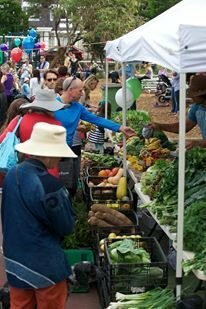 Best farmers market in Sydney? Nowadays, people are more conscious of the food they eat. No different to how Sydney residents are feeling right now in this respect. We want to enjoy fresh, quality produce. Needless to say, farmers markets are becoming popular in their own right as a result. There are a couple of quality farmers markets out there in Sydney. Where are they? Are they held on a weekly basis? Or less often? What type of produce can you buy at these markets? Is parking a challenge or a joy? Decent farmers' markets are popping up all over, but two that are must-see, including for visitors, are Eveleigh on a Saturday and Marrickville on a Sunday. They have a huge variety of produce and cooked food vendors and are in gorgeous surroundings. Go early if you want to drive and get the best produce! Another one is on Gardner's road, Rosebery, which is not too far from Marrickville if you get there and it's too busy. The farmers markets at Orange Grove Public School in Lilyfield are fantastic. Quality produce and friendly vendors. Love the different range of organic fruit and vegetables. The food range is diverse. Parking is never an issue. A bush feel is alive and well. What is the best ferry route to take in Sydney? Best free entertainment in Sydney on a Saturday night? Best yum cha in Sydney?